"Always ready with a hand for oppressed men, and an eye for repressed women." Michael Waring is the freelance investigator, troubleshooter, and adventurer known to one and all as The Falcon. One part The Saint, one part Boston Blackie, and one part Philip Marlowe - Waring can be suave and charming, especially when a lady is involved. But, there's never any doubt about his nail-spitting toughness, nor of his impatience with the plodding methods of the police - most often expressed in an endless stream of clenched-teeth wisecracks. 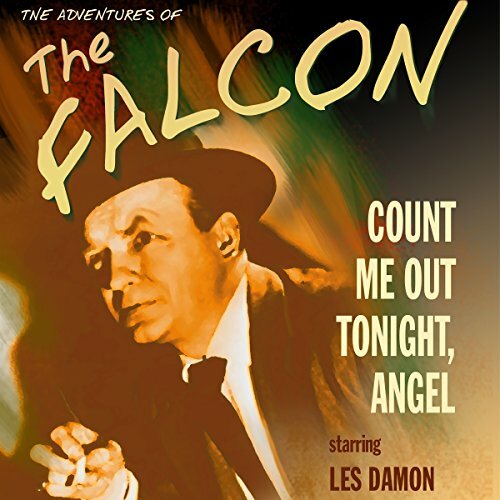 Les Damon brings an ever-so-slightly-world-weary tone to the title character in 15 of these digitally remastered and restored radio episodes, with James Meighan making one appearance as The Falcon. Also heard in these broadcasts is radio regular Jackson Beck and announcer Ed Herlihy. Episodes include: "Murder is a Family Affair" 11-27-45 starring James Meighan as The Falcon, "The Case of the Quarrelsome Quartet" 09-03-50, "The Case of the Worried Champion" 09-10-50, "The Case of the Double Deal" 09-17-50, "The Case of the Friendly Target" 09-24-50, "The Case of the Talented Twins" 10-01-50, "The Case of the Invisible Thug" 01-07-51, "The Case of the Happy Hoodlum" 01-14-51, "The Case of the Substitute Target" 01-21-51, "The Case of the Worried Wife" 04-01-51, "The Case of the Carved Ham" 04-08-51, "The Case of the Shopkeepers Gun" 04-15-51, "The Case of the Missing Miss" 04-22-51, "The Case of the Beautiful Bait" 08-22-51, "The Case of the Gold Ring" 02-24-52, "The Case of the Vanishing Visa" 06-19-52.